It’s that time of the year when thoughts turn to that delicious, warming, and most versatile of vegetables, the humble potato! The Conduit was intrigued by the aptly named “Somerset Potato Day” and decided to find out more from Chris Smith at Pennard Plants. Chris explained: “Some years ago, 14 in fact, we started ‘Somerset Potato Day’ to offer the gardeners in the local area a wider choice of seed potatoes to grow. Back then I think we were offering around 30 varieties, this has now expanded to nearer 100, being offered to gardeners throughout Somerset, Dorset, Wiltshire and as far afield as Oxford (new event for 2108) and London. “These we run in conjunction with Garden Clubs and Allotment Associations but the ‘Somerset Potato Day’ we still run on our own, with free admission, at Caryford Hall in Castle Cary. Not only do we offer seed potatoes but also our range of heritage and heirloom seeds, onion sets, shallots, fruit trees and bushes and more. The seed potatoes are sold ‘by the tuber’ enabling the gardener to try lots of varieties or buy just a few for a pot rather than having to buy packs which often contain more than is needed. “Where do all the potatoes come from? Well, we scour the growers early in the season to find the varieties we want. Seed potatoes must be certified as free from diseases and thus are mainly grown in Scotland although we do have a few varieties from England, Northern Ireland and France. In Scotland there is a ‘bank’ of varieties held by SASA, (Science & Advice for Scottish Agriculture), they have around 800 varieties. Of these around 200 are grown as ‘seed’ potatoes. These have to be registered on a EU register in order for them to be propagated and sold (what will happen after Brexit!) and some only in very small quantities. “In stores and farm shops you will only find a very limited choice from these 200 varieties as some produce only small crops which are not viable for the commercial grower but as many of these have great flavours and cooking qualities they are well worth growing in the home garden. Varieties such as ‘Epicure’, the Ayrshire Potato, a floury but delicious first early, ‘Shetland Black’, the Crofter’s Potato, black skinned and very tasty when steamed, ‘Golden Wonder’, (nothing to do with the crisps), a long storage variety with a russet skin and fabulous taste for roasties. These are just three from our collection. “Potato varieties all have individual flavours and textures, some can be waxy (for boiling and salads), some floury (for roasties and mash), some have coloured flesh if you like red or purple mash or chips. 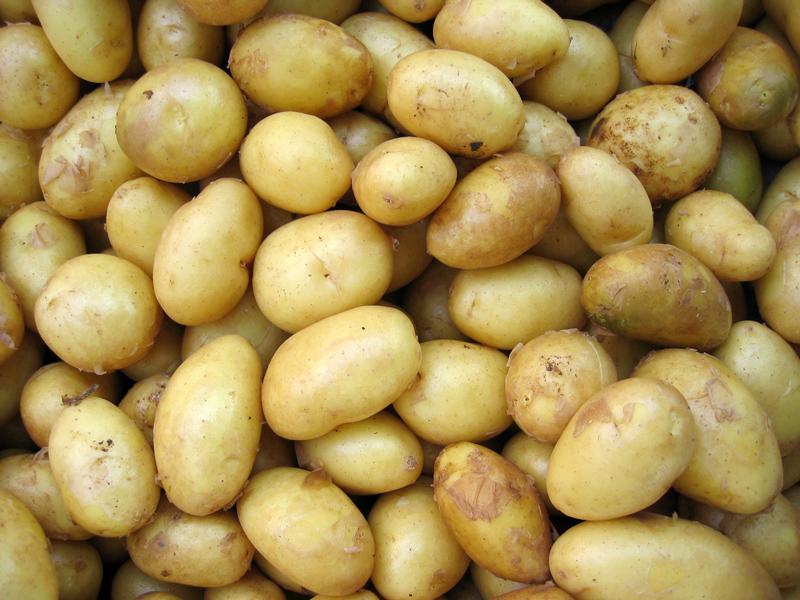 “Potatoes are also classified by season, First Early take 10-12 weeks to produce a crop, Second Early take 14-16 weeks and Maincrop 18-24 weeks. All varieties should be planted end March, beginning of April, they just take longer to grow and mature dependant on the type, First Earlies produce the smallest crop but are ready first and are you ‘new potatoes’, whereas Maincrop take much longer but produce a much larger crop, these are the ones to store for winter use.